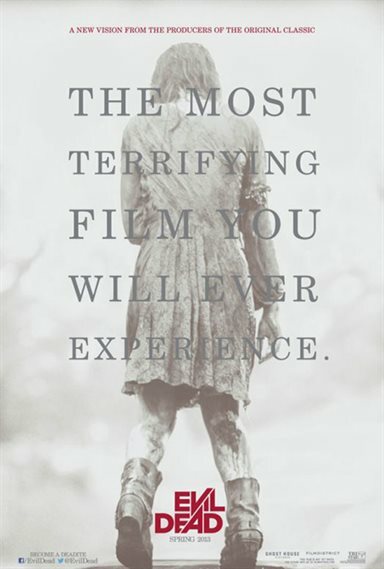 Evil Dead Is A scary blood fest of evil and debauchery. New faces save Evil Dead from getting inane in this respectable remake of a Sam Remi film. The horror flick has some very good special effects, CGI and makeup that turn the film into a gory blood bath. Although the script does follow the original made in 1981, the evil in this film far outweighs anything Remi did 32 years ago. Horror fans should be eating this one up with a side of plasma. Click here to watch our exclusive interview with Evil Dead director, Fede Alvarez. A car driven by David (Shiloh Fernandez) accompanied by his girlfriend Natalie (Elizabeth Blackmore) and his dog Grandpa speeds along a wooded highway then turns onto a side road that leads to a thick wooded area in a forest. David pulls up to a decaying house where three people, Mia (Jane Levy) his sister, Eric (Lou Taylor Pucci) his best friend, and Olivia (Jessica Lucas) are upset over their late arrival. After exiting the car David tries to make amends for the lost time, but Eric makes an issue of it. Being best friends, the group has taken on a surprise intervention of getting Mia off drugs by having her go cold turkey at the remote cabin. After they settle in Eric finds a strange book and starts to read passages from it. As he reads a bizarre sentence aloud Mia freaks out from her drug intervention and runs off into the woods. There she sees a strange teen with an evil look causing Mia to run away screaming toward the cabin. The film gets very dark and gory as each of the cabin mates gets exposed to the evil that has taken hold of the house. Director Fede Alvarez does his best to scare as he slowly starts to infuse wickedness drawn from the strange teen that infects Mia. Adding a lot of disgusting gore, slicing and dicing, mixed with a doom entrancing soundtrack and a heavy measure of disquieting sound effects, Alvarez accomplishes a psychotic atmosphere that chills and terrifies. The only downside comes with the fact that the film is predictable, but if you just go with the flow, your terror genes with overcome this flaw. The set alone becomes a character in the plot as the old log cabin becomes a repulsive cage with its animals being the five unknowing visitors. The rotted wood of the logs that make up the frame are like shredded skin, its stairs to the basement are weak and covered in a coating of dried blood, while a bedroom becomes a ghastly entryway into a bathroom that beckons fear. Alvarez adds bloody rain, lightning and a quagmire of mud to his terror as each element takes a stab at making the lives of the five friends fearful and disoriented. The acting by some fairly new role players becomes important to keeping the film's story the center of attraction. Evil Dead depends on the good acting by a nice group of newcomers including Jane Levy (Fun Size, Shameless) with just 6 titles, Shiloh Fernandez (Red Riding Hood) appearing in mostly indies, Lou Taylor Pucci who was amazing in the indie film The Story of Luke, but the film only ran the film festival route, Jessica Lucas who played Lilly in Cloverfield and Elizabeth Blackmore who has had a fair run at a couple of TV Series. It's their ensemble acting in Evil Dead that brings out their talent and makes the film work as horror. Evil Dead has been rated R by the MPAA for strong bloody violence and gore, some sexual content and language. While this is not the exact copy of Sam Remi's The Evil Dead that was released in 1981, but if you have seen that film you may have a sense of déjà vu, however that movie doesn't hold a candle to this horror surprise. Download Evil Dead from the iTunes Store in Digial HD. For more information about Evil Dead visit the FlickDirect Movie Database.